Post words to all verses and chorus (optional). For Senior: Tell them we are learning a song that is all about rainbows and rain. Isn't that odd that we'd learn a Primary song all about rainbows and rain? There are 3 different ways this song is about rainbows and rain and your job today is to figure out those 3 ways. I have a help for you (pass out wands). If you watch me closely, I will give you hints with the rainbow wands (if needed). 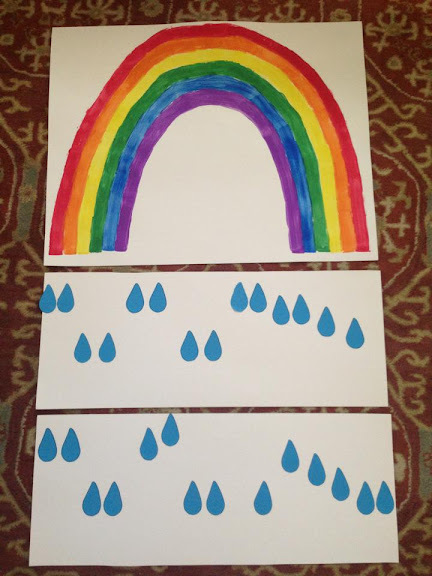 If you are comfortable, you can demo all three items listed below as the children watch you and try to find 3 ways the song is about rainbows and rain. Once they have answered, go into detail on each item. 1. This song TALKS about rainbows and rain (each time rainbows/rain are sung, raise your wand in the air). After you have sung through it, ask why this song is about rainbows and rain. Discuss how they are like being baptized and repenting. Bear testimony of the blessing of baptism and how we are made clean. If we make mistakes, we can be clean again by taking the Sacrament and repenting. 2. This song SOUNDS like rainbows and rain. Legato (the verses) and Staccato (chorus). The verses are smooth and connected like rainbows. The chorus is more choppy and disconnected like rain. Sing the verses legato and move your wands back and forth without breaking. Then during the chorus, quickly shake the wands for each note as you sing it staccato or choppy. Make sure to over-exaggerate so they can tell the difference (have the pianist do it too)! You can also make a "thunderstorm" by making large movements and singing loudly and a "light rain shower" by making small movements and singing softly. Also discuss breathing using Legato and Staccato. Try to have everyone sing the whole verse in one breathe and then breath after each note in the chorus. Afterward, ask which one everyone thinks is easier! 3. This song MOVES like rainbows and rain. The song (its pitch) moves like a rainbow and raindrops. Notice each line in the verses' pitch start low and gradually go higher then go back to low - just like a rainbow. Then for the chorus, the pitch is disconnected, up and down, all over, just like raindrops. During the verse, draw a rainbow with your wands going up as the notes go up and going down as the notes go down. During the chorus, follow the raindrops you drew on the board and with your wand, follow them by moving it up or down. For Junior: I'll go through the 3 items but they won't have to figure them out. I'll simply tell them and we'll move our wands together. You can download and print my to-go lesson plan HERE and take it to church with you. This is a great idea. I made rainbow wands a few weeks ago and wanted to do more with them than just wave them around. Thank you so much for the help! I like your idea as well. Can you tell me how long the ribbons actually are and how long it took to get them from haloheaven.com? The ribbons are 16" long and the white plastic sticks are 12". As for shipping, their website says orders are shipped within 5-7 business days. I'm in Utah and if I remember right, I think I received them pretty quickly - like in about 6 - 8 days from placing my order. I hope that helps - I've really loved them and they were totally worth the investment. I have a huge primary! I have some but I couldn't possibly order one for each child. Do you think it would work to take turns, switching off every other time who gets a wand/using their hand? I think taking turns would work - you could switch with each verse as you do the 3 different actions twice when you sing each verse. Then the kids without a wand can use their hand or give them a popcycle stick so at least they have something to hold. Just to give another idea, I made mine out of variegated rainbow colored yarn. I just cut basic section for each color from the yarn grouped them together and tied them around a small Popsicle stick and then taped (around and above and below the not) them on with white duct tape (for the cloud). They were pretty fast to make and cost somewhat less for those with !!Big!! primary groups. It was just stuff I had on hand. Thanks Camille for the great ideas! Camille I just can't thank you enough. You have saved me with all your ideas. I'm truly indebted to you. I know it must take A LOT of time to come up with the ideas, but then to post them and all the links...you deserve BIG hugs! Thank you so much! If you don’t have the resources for wands, or they just make your kids too crazy, you can also try having each child pretend he or she has a piece of chalk or a crayon or whatever, and tell them it’s “magic chalk” or a “magic crayon” (Sharla Dance uses magic crayons in a different and fun way). When I taught the song last year, I drew the rainbow on the board with colored chalk one stripe at a time as we sang, helping them discover the meaning and connecting the music to the message, similar to what you have suggested here. My melody maps for the chorus were raindrops as well (thanks to probably the same lady from a blog), and we used our hands to “pop” raindrops, following the shape of the melody map. It was fun to pop “best” all the way up high because we went to be the BEST we can! After the initial explanations, we had a full rainbow on the board. I then invited my kids to draw their own rainbows as we sang, using their pointer finger like chalk or a crayon, so we were drawing rainbows on the verses and popping raindrops on the choruses. I had them draw with one arm and finger from right to left and then from left to right, just to involve both sides of the body the whole song. The possibilities for connecting rainbows and rain and the sun shining to make a rainbow to how the music was written (doesn’f a fermata look a lot like the sun shining to make a rainbow? :) ) are many. Junior really loved this and caught on well, and even Senior enjoyed learning this. I love teaching this song! And as always, Camille, I love your ideas!